Last week a video went live of our adventure to Sandy Cape, right here in Western Australia. I’d heard about the place for years but never been! So in this blog post I’m gonna tell you what it’s like and how to get there. But first, you might like to take a look at this video! I guess I’ll start with the history of this place. There are two of these buildings, at the time we were in the area I was unsure of what they were. But after a few comments from people on the YouTube channel and a bit of googling, I now believe the idea that they were to do with radar establishments in World War II. There’s some awesome little bays around the Sandy Cape area, some a little more sheltered than others which is important because Sandy Cape is well known for being windy as hell! On the other hand, the place seemed to be fly blown as a sheeps backside when we were there; if there were a little more breeze the flies may not have been so annoying! You can camp like….a 1 minute walk from this! That image of our campsite leads me to the second part of Sandy Cape’s history and its days as a community of fishermen shacks! There was maybe near 200 shacks in the Sandy Cape area used by commercial fisherman and holidaymakers alike. In fact, a couple in our crew used to have a shack there! Sadly, the government made everybody knock them down and burn them. At least we are still allowed to camp there! Here’s a few images I found on a blog called Sharkcavers which happen to be of the shacks which used to stand exactly where we were camping! 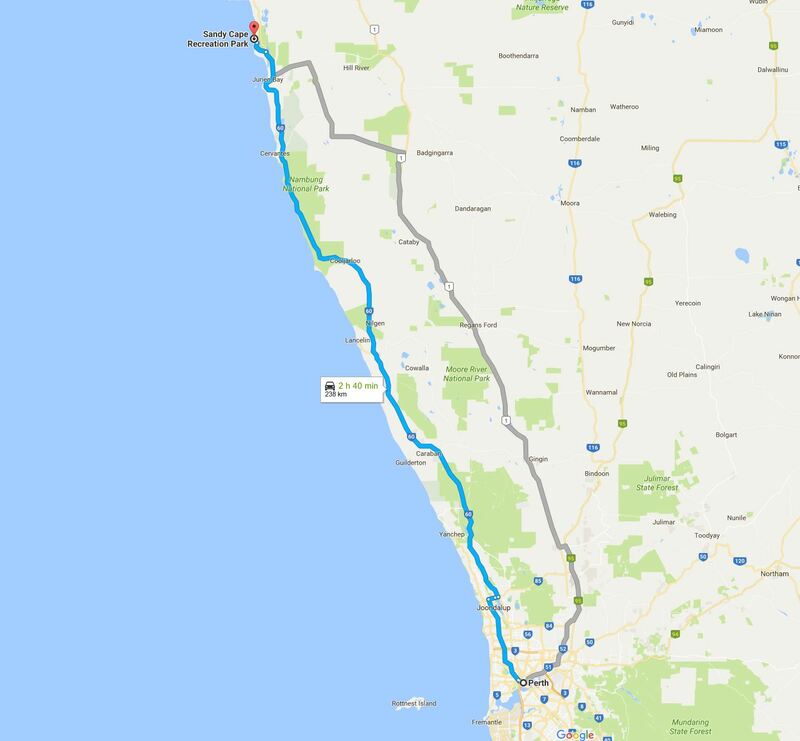 Getting to Sandy Cape from Perth is gonna take you about 2 hours and 40 minutes from the CBD, according to Google Maps. Once you reach Jurien Bay, the turnoff to sandy cape is only about a 10 minute drive further on. The turnoff is well signposted. You guys going to do this again and break another world record. Next time let me know as I had planned to go to this years one, but Murphy,s law set in and before I remembered it was too late. So I missed out. Are they setting up to do it again? I didn't go last year either, but Kyle who writes on here a bit went and had a blast! Hi Alex. Many thanks for the informative post and that pic from the AWM, just brilliant. The credit for those pics goes to Pat, as described in my report. Cheers! Hey mate, glad you enjoyed the read! Yeah I used a drone for a lot of footage as well as a range of GoPro's. There's not a lot of traffic on the way to Sandy Cape no, unless you're going in peak holiday season. I reckon the best time to go would be late spring, October or November perhaps!